Quick synopsis: This is the first in a series of weekly blogs talking about and around the films I’ve watched in the week gone by, Monday to Sunday. The idea is to fill in the blanks between incredibly long essays and infrequent notifications of other stuff I’ve been up to. This week, Christopher Kenneally’s Keanu Reeves-fronted documentary Side by Side on Film Four, James Cameron’s Terminator in the open air, the much-maligned Heaven’s Gate reassembled and remastered at GFT and an unplanned interlude with an asteroid. First a quick, fairly representative word on the kind of typical digression that leads me away from silly things like finding gainful employment in a fulfilling profession or indeed updating my blog. The trailer for Vampire Academy: Blood Sisters (2014) piqued my interest because the film is written by Daniel ‘Heathers‘ Waters and directed by his brother Mark ‘Mean Girls‘ Waters. The trailer might mean more to fans of the novels, but so far I’m undecided. Is it too much to expect the brothers to deliver a spiritual sequel to their respective greatest triumphs, but with added vampires? Probably, I guess, but the trailer inspired me to check out Daniel’s Wikipedia page. There I was reminded, if I ever knew, that the notorious Bruce Willis bomb and film of my childhood Hudson Hawk (1991) reunited Waters with his Heathers director Michael Lehmann. Extraordinary! Anyway, since Waters wrote the inestimably great Heathers and the pre-Nolan peak Batman Returns (Tim Burton, 1992), I figured I was overdue for investigating the rest of his IMDb credits. Demolition Man (Marco Brambilla, 1993) has long been ticked off my bucket list, but what’s The Adventures of Ford Fairlane? Another bomb, this time a Renny Harlin-directed 1990 vehicle for Andrew Dice Clay, which tied for the Worst Picture Razzie that year. To put that further in context, the plot of the other winner, Ghosts Can’t Do It (John Derek, 1990), has Anthony ‘La Strada’ Quinn kill himself when he can no longer perform sexually for his young wife (Bo Derek). Quinn then returns as a ghost and together they begin plotting the death of a young man so that Quinn can possess his body. So we can assume Ford Farlaine is at least pretty awful, although at this point I’ve pretty much talked myself into seeing both of them, soon. Ghosts Can’t Do It – Bo Knows! The Adventures of Ford Fairlane – Yes, that is Vince Neil getting shot at the start. So much for films I didn’t see this week. I missed this documentary when it came out, so I was glad to finally catch it on FilmFour. Keanu Reeves interviews a range of movie industry notables, including a slew of famous directors, about the relative values of digital and ‘analogue’ filmmaking. Fascinating for its balanced account of the way digital technology has transformed the industry, the film examines in turn the impact it’s had on every aspect of the filmmaking process, from shooting to theatrical distribution. Digital has been creeping in for many, many decades now, and Side By Side covers ground you might predict – the relative quality in output from the photochemical film process compared to digital, the streamlining of the editing process with the introduction of the Avid and digital nonlinear editing, the rise of CGI, etc. There are plenty more fascinating angles though, from the growing importance of colourists working with software to achieve what DPs find impossible in camera to the direct line between Festen (Thomas Vinterberg, 1998) and 28 Days Later (Danny Boyle, 2002), embodied in the revolutionary camerawork of Anthony Dod Mantle. Great documentary, overall, and worth a watch if only for the unapologetic tone struck by early adopters David Fincher and Robert Rodriguez. And, of course, David Lynch’s charming habit of referring to Reeves by his first name. 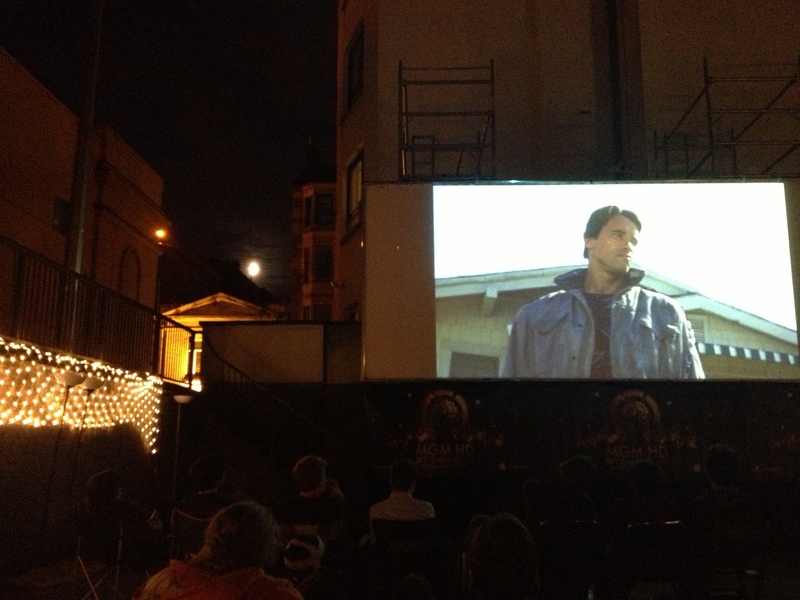 This was a Grosvenor Cinema/DIY Cinema/Bring Your Own Seat event, sponsored by MGM HD and Air New Zealand. Set up in lot behind Hillhead Library, the audience was invited to accommodate themselves in front of a scaffold-mounted screen, where big rugs had been laid out on the concrete. There, as the sunlight faded and the scent of the hot dog concession stand wafted over the amassing crowd laden with all manner of seating, MGM goodie bags were handed out. Organiser Kate Coventry of the Grosvenor gave a brief introduction, thanking the sponsors and explaining the emergency exits, then we watched Terminator in the open air, just behind Byres Road on a Friday night. A great film, a great idea and a great location – you wouldn’t know it was there from the street, but the alley leading to and from Hillhead Bookclub meant an irregular stream of variously confused and enthused randoms strolling by. Hope they do it again, and soon. Plenty’s been said about Heaven’s Gate – including that it’s long overdue for a critical reappraisal. Seeing it in GFT’s biggest screen in a new director-sanctioned, reassembled and remastered cut was the best opportunity to see it own its own terms. God knows, Heaven’s Gate’s got a lot going for it, not least 30 years in cinema jail following its disastrous theatrical original release run. Since then, I reckon it’s been largely overtaken as a byword for cinematic excess by Ishtar, Waterworld and, most recently, The Lone Ranger. The stories of Cimino’s megalomania stand unchallenged, but some of the myth needs to be dispelled – Cimino didn’t get away with murder, he was handed a licence to kill by studio executives and he used it. The film is long, there’s no doubt about that, but Cimino is no Béla Tarr and ‘expansive on the wrong side of baggy’ just about covers it. Upon release, Heaven’s Gate had impossible standards to meet -it would have to been Citizen Kane meets Star Wars to overcome the negative press – and the knives were out anyway. 33 years later, it should be easier to judge it on its own terms, and for me the positives outweigh the negatives. The film boasts an incredible cast – Kris Kristofferson, John Hurt, Jeff Bridges, Brad Dourif are all great, even if an elfin Christopher Walken seems a little at sea. The film looks beautiful and the score is great, although periodically sloppy framing and sound design lets the side down, though that’s certainly not the fault of Park Circus and the restorers who have done a beautiful job. There are also several scenes and performances that brand themselves instantly on your memory, including Kristofferson’s refutation of accusations of class treachery from the villainous Sam Waterson (“You’re not my class, Canton, and you never will be. You’d have to die first and be born again.”) and Brad Dourif’s impassioned, provocative speech in broken English to the frightened, threatened and disorganised immigrant population of Johnson County. These perhaps wouldn’t be so subsumed in a less sprawling film, but in the end I found Heaven’s Gate positively immersive rather than simply messy. It’s challenging, thought-provoking, bravura filmmaking and doesn’t belong in the same category as Wild Wild West. I’ve recently tried to implement a policy of not watching the same film twice – or, more particularly, reducing the amount of film watching time I’ve previously squandered on watching a comfortably escapist film three or four times (plus Blu Ray extras). I think if you watch a lot of movies, love movies, then you get to a certain point when you realise you can’t possibly see them all, even the interesting ones. And while a lot of people who take writing about film seriously would not think twice about not having seen The Adventures of Ford Fairlane, I’m one of the ones that does. On the other hand, I don’t have the privilege, credibility (or apparent eidetic memory) of those I admire – Kim Newman, Quentin Tarantino to name a couple – who have utterly dedicated their lives to film and talking about it. I also reckon I’m stuck fatally between popular and academic writing, so even the meagre wages of mainstream scribbling and subsidised academia aren’t on my horizon. I’m sure somewhere there’s a monastery with its own theatre (35 mm but 4K digital capable, of course), subterranean vaults filled with rack after rack of DVDs, VHS, Blu Rays – jesus, is that a Laser Disc? – and superfast broadband supporting lifetime subscriptions to Netflix, Love Film and international immunity from piracy prosecution. Can’t embed the clip, so please click here! So…either you found that funny or you didn’t. To me, there’s something genuinely absurd and therefore funny about the way Bruce floats in and out of frame, chuckling. I would very much like to see that stripped out and inserted into and and all suitable clips on the internet, immediately. Either way, that’s the kind of gold you come up with to justify watching a film like Armageddon nine times. This entry was posted in GFT, Glasgow, Reviews, View History, Working Hard/Hardly Working and tagged Armageddon, DIY Cinema, FilmFour, GFT, Ghosts Can't Do It, Grosvenor Cinema, Heaven's Gate, Hudson Hawk, Side by Side, Terminator, The Adventures of Ford Fairlane. Bookmark the permalink.